I rough hammered mine and aged them with a torch, then packaged them up to give to some friends. These are cute and I love anything to do with copper. These are great. I saw them on crafty crow this morning and made an apple shaped one for my son's teacher straight away. Thanks! 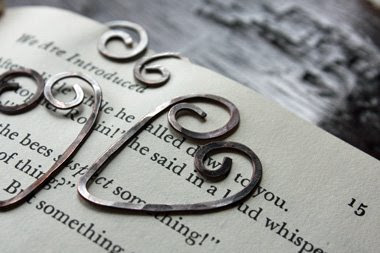 UK Lass in US: Oh, an apple bookmark is a fantastic idea! What a great craft! I'm going to have the girls in my daughter's bible group make these this week. These are lovely, and your packaging takes them from "trinket" to "pressie!" Nicely done! 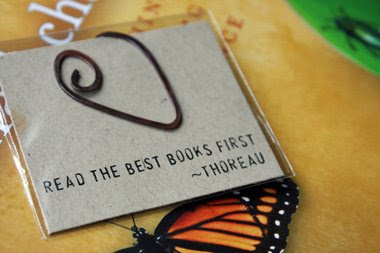 Hi, those bookmarks you made are beautiful! What kind of torch did you use to age the copper? Edharob...Thanks for the comment! I just used a little butane torch I have from the hardware store. I used 3 gauge copper wire and it was pretty hard to bend it in right shape, however now bookmark will be much stronger and won't bent easily. For thicker wire i suggest to heat it up before hammering it.